Quick note: I was waiting this gig for months, and it took me many adventures to get in, and also some real luck! Tickets sold-out, scums, running and rain, and then, finally I got the tickets! Hurrah! I went inside the legendary Electric Ballroom in Camden Town, a place where many legends of punk and rock played in the past. I get in just in time to listen to the last minutes of Grade 2 set, a punk rock trio from the UK, who, along with Maid of Ace, were the openers of the night. Unfortunately, due to my misfortunes, as I was saying, I missed the opening acts, and that’s something that usually makes me disappointed. However, I hope I will see again both bands, and meanwhile check ‘em out! A bit of wait and finally The Interrupters got on stage. The band has collected many success in the last years, and while the immediately won the hearts of ska fans, they incredibly gain attention also among the punk purists, especially thanks to their great energy, and the powerful voice of Aimee! They have recently published their third album (you can check out our review here) and by now the four Californian kids know how to do their job! And so, among jokes, fake covers and gags by Kevin, the band played all their success songs such as ‘Friend Like Me’, ‘Babylon’, ‘She Got Arrested’ and above all ‘Take Back the Power’, and, well, if I was already sweating, with this song I lost completely my voice. Of course they played also their new songs, and so let’s go back to dance with ‘She’s Kerosene’, ‘Gave You Everything’ and ‘Broken World’. Best moment: Kevin tried to play different songs, (even Metallica I think) before getting the right riff and start playing ‘Sound System’ by Operation Ivy (even if I believed, for a sec, that they wanted to play Time Bomb…). 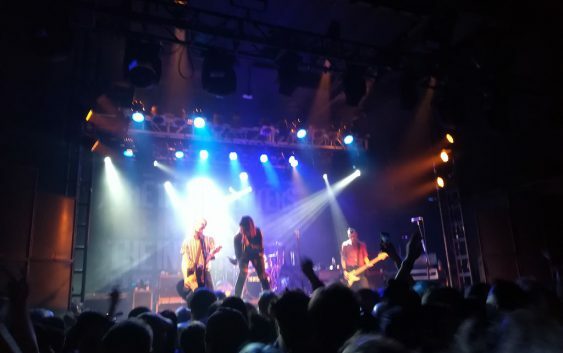 The show ended with the most heart-felt songs, which burn down the whole Electric Ballroom: ‘Got Each Other’ and ‘Family’. Between a joke and another, the four have played more or less 20 songs and I felt on my body all of them. Well, after all those adventures, it was really worth it! So, well done to the Interrupters, and I hope I will see them again soon!